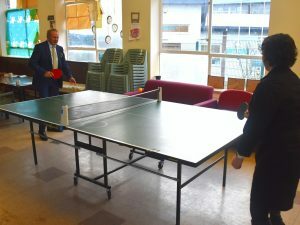 A charity in Newcastle’s Outer West is the latest beneficiary of the region’s social mobility fund – which has now handed out over £150,000 in its first year. The Harrison Centre for Social Mobility was launched last November to support charities which help people, particularly from disadvantaged backgrounds, to learn new skills. The latest in a long line of beneficiaries is the Denton Youth and Community Project (DYCP), which has received a £5k grant. Catherine McKinnell, the MP for Newcastle North who recommended DYCP to Harrison Centre, officially handed over a cheque to the charity with Harrison Centre founder, David Harrison and local councillor Daniel Greenhough. Through various youth and community activities, DYCP aims to give the individuals it works with the best possible start in life; and to ensure people of all ages remain connected to their local community. Other recent recipients of support from the Harrison Centre include Chillingham Road Primary School in Heaton. Earlier this month, it took delivery of five laptop computers, saving the equivalent of two years of the school’s IT budget. In October, youth development charity NE Youth, which provides information, advice and support to young people, was awarded £5k from Harrison Centre. Also receiving funds in October was Loftus Community Centre, enabling it to continue running a credit union and training and support services for people in Redcar and Cleveland. The Harrison Centre was founded by David Harrison, founder and managing partner of Newcastle-based financial services and technology firm True Potential. Its aim is to improve social mobility in the North East, by advising, funding and supporting charities that are improving the prospects of people they work with. As well as donating more than £150,000 to local social mobility charities in its first year, it has also set up a teaching facility, at the Beacon of Light in Sunderland, working with young people aged 14 – 18. Earlier this year, David Harrison also partnered with former Secretary of State for Education, Justine Greening MP, to launch the national Social Mobility Pledge. Some of Britain’s largest businesses have signed up, including Tesco, John Lewis, M&S, BP, Adidas and Vodafone. More than one million employees are now covered by the Pledge, which commits businesses to working with local schools, offering apprenticeships and adopting fair recruitment policies. The aim is to create a more level playing field with job opportunities spread more fairly.